Parkview Moorings 240E. Right on the Black River with Awesome Views. Walk Everywhere. 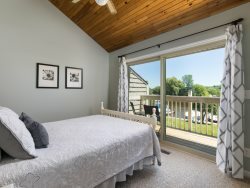 Your own private getaway in the heart of South Haven. Step outside to the patio to read or grill. Go up a few steps and you're pool side to take a dip or sun. Pop back in to grab a bite and check the score on the game. A 10 minute walk takes you to Lake Michigan at the Dyckman Street access or the main South Beach. Central air, washer/dryer, and fully equipped kitchens are just a few of the amenities the condo offers. An elevator brings you up one floor from the enclosed garage. Just steps away from dining, shopping and swimming, you're guaranteed a great value. Parking for 1 in the enclosed garage. There is also a free City lot next door. We enjoyed this property. It is easy to access and is close to dining shopping and beaches. We would highly recommend! Perfect location to shops and beach. The house had everything we needed from nice furniture and comfort beds, and the kitchen had all that was needed to make full meals. The owners had everything well thought out. Thanks again for another wonderful vacation. Very easy to work with!!! Very lovely place and very convenient to downtown !!! LOVED IT!!!!! Very friendly , attentive and easy! The property was very well maintained. The unit that we stayed was updated, very cosy and clean! The only negative is the master bedroom wall is in the court yard and it gets loud early mornings on the weekends. I would defintly stay in the unit again ! THe location was great! Team members were very quick and efficient about returning my calls or emails. I never had to wonder about something, because they were always available with an answer! Thank you for making this experience such a simple one! We had a great stay! The proximity to downtown is perfect. We walked everywhere we went and always felt safe. The property provided all that we needed for our stay. It was clean, well-kept and quiet. We will definitely return! Your staff was super. The first property we rented was sold and would not honor our reservation so when your staff posted this one we were ecstatic. The property is a great location to the beach, to shopping, to the parks and to ice cream!